Let me just say it: I did some traveling this past weekend. I went to Oberammergau, Germany after being invited to attend the premiere of the Passionspiele, the Passion Play that happens once every ten years. (You can find out more about our Salt + Light sponsored trip in August to see the Passion Play HERE.) The closest major city to Oberammergau is Munich and I got to spend an evening and a morning there. Having limited time, I grabbed a city map, asked a local for suggestions on where to go and soon found myself in the heart of historic Munich, surrounded by people wearing orange scarves. Using my very limited German (I can order water and say I'm sleepy) I found someone who spoke English and asked, "What is that? ", pointing to the orange scarf. It turns out the orange scarves were part of the swag being given out at something called Kirchentag, or Church Congress. Kirchentag began in 1949 as an annual congress of Germany's protestant Churches. The idea was that since the Church and state had officially been separated by the Nazi regime, Christians needed a way to come together, be strengthened in their faith, and encouraged in bearing witness to Christ in their daily lives. In 1954 it became a biannual event, happening every two years. In 2003, Kirchentag went Ecumenical with Catholic and Protestant churches working together to organize the event and opening it to all faiths. 2010 Kirchentag was held in Munich this past week and the theme was "That you may have hope". One participant told me, "It's not just praying together. We discuss all kinds of issues -- immigration, human rights, poverty, universities -- in the light of our faith. You know, we're from all different back grounds, but on those topics we believe a lot of the same things." The majority of Kirchentag participants happen to be under thirty, so a major focus of the congress is on bringing youth of different faiths together to see that they're not all that different. Friday evening as I walked through Marienplatz, Munich's main square where a stage was set up, four youths were on the stage sharing their experiences. A young man from Poland was explaining that he had participated in a theatre workshop that included, among others, youth from Israel. He said while working with them to put together a short theatre piece, he realized that "religion is not something that divorces us from each other, it gives us lots to talk about in common." He said for him one of the most significant moments of the gathering was going to the Munich Olympic Village. During the 1972 summer Olympics, eleven Israeli athletes were held hostage and killed by armed gunmen with ties to a militant Palestinian group. Today a monument stands in the Olympic village to remember those Israeli athletes, and the youth participating at Kirchentag had the chance to visit the monument in ecumenical groups. All the congress participants I came across had huge smiles on their faces and exuded a peaceful radiance that I kind of envied. I understand why, in his message to Kirchentag participants, Pope Benedict XVI said, "You are sending a message of hope to the world and the church and I thank you for this." He added, "Weeds exists even among those God had gathered close to himself to serve him in a special way. But the light of God does not set, His great goodness is not choked by the weeds of evil." His words were certainly reflected in what I saw in Munich. I came across a beautiful Catholic Church called the Church of the Holy Spirit, just off Marienplatz. 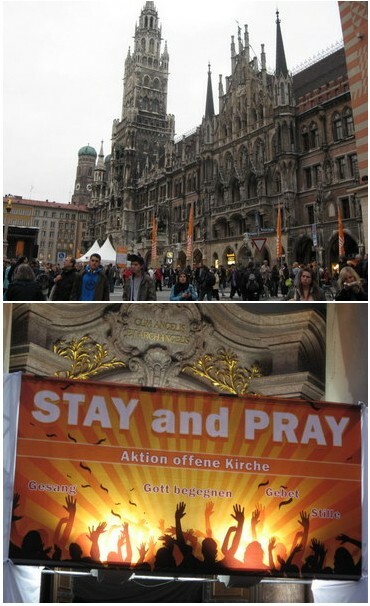 There was a huge banner over the entrance that read "Stay and pray." Below the banner streams of people were going in and out of the church. I followed the stream and discovered that people were doing just that: going in, staying and praying. All faiths, all nations, sitting in the pews and silently praying. Then leaving and taking with them the peace that comes from sitting in God's presence out into the world. The next Protestant Kirchentag is scheduled for Dresden in 2011. The next Ecumenical Kirchentag has not yet been announced. For more information on what happens at an ecumenical Kirchentag visit HERE.